Tor is an excellent obfuscation network for web traffic, and while instant messaging over the network is very useful, it can be relatively difficult to configure. In this guide, we’ll look at two synchronous communications platforms (instant messengers) which can be routed over the Tor network, Ricochet, and XMPP. Ricochet, as described on its website, “uses the Tor network to reach your contacts without relying on messaging servers. It creates a hidden service, which is used to rendezvous with your contacts without revealing your location or IP address.” This technique leads to Ricochet being one of the most secure messaging programs available, visible in the Secure Messenger Scorecard by Yawnbox, which was based on the prior work of the Electronic Frontier Foundation. 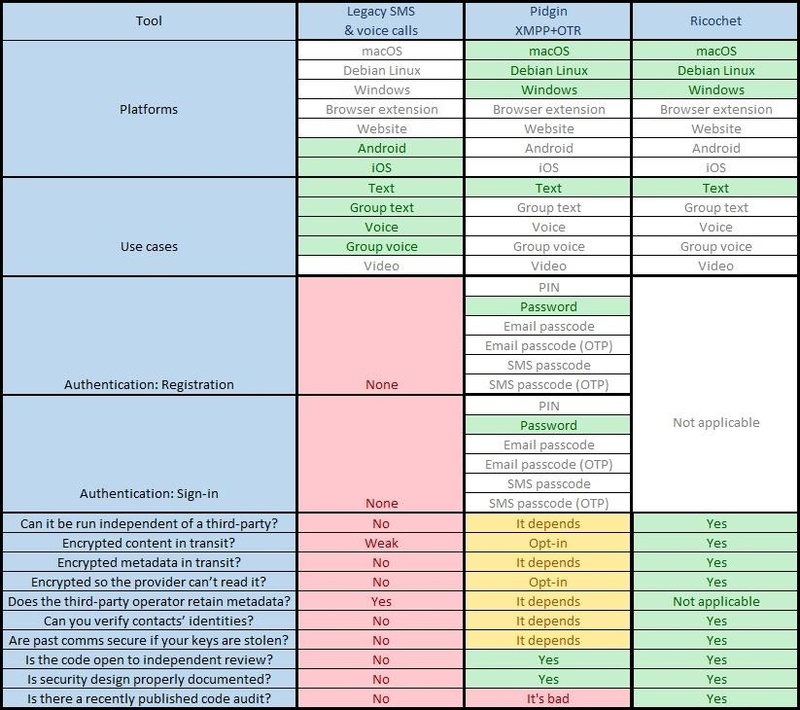 This chart compares XMPP and Richochet with legacy SMS and voice calls, showing the difference in features behind each messaging platform. XMPP is not inherently secure in itself, but it can be combined with other technologies to make it very secure while offering some features that Ricochet does not. Unlike Ricochet, XMPP traffic is passed over a server which isn’t under the control of the user, offering less privacy in this sense than Ricochet. However, this setup allows for messages to be carried even when users are not necessarily online. After downloading the Ricochet source, we’ll need to make sure we have all dependencies before compiling. On Debian/Ubuntu, the following commands should work assuming all dependencies are found in the repositories. Next, move into the Ricochet directory with the command cd. We can launch Ricochet by running “./ricochet” from within the Ricochet directory. Errors and warning messages will be logged to the terminal from which this is launched. On the first run, Ricochet will prompt the user to configure their Tor connection. Unless you wish to use bridges or have a censored or proxied connection, simply clicking “Connect” should be sufficient. Once Ricochet is running and connected to Tor, we should first click the “Preferences” cog icon and then the “Tor” tab to confirm the Tor version in use. If the Tor version is at least 0.3.X.X, Ricochet is safe to use as of October 2017. The interface of Ricochet is relatively straightforward. The plus icon at the upper left of the window allows you to add other users based on their ricochet identifiers, formatted as “ricochet:” followed by a string of random characters. The nicknames or contact names assigned to a given ID are entirely client-side, however, when adding a new user, one can include a short message to help identify oneself. Instead, we can use XMPP, Tor, and several encryption plugins by using an alternate client. Pidgin is a multi-protocol instant messaging client available for Windows, OS X, and Linux. To be able to route it over the Tor network, it’s simplest to point it towards the Tor service on a Linux distro such as Ubuntu, Debian, or Kali. Pidgin is available at the Pidgin homepage and in most Linux repositories. After Pidgin is installed, launch it by running “pidgin” on the command line or navigating to it through the applications menu. Keep in mind that while the contents of messages will be private from a server administrator due to encryption, other metadata including messages times, conversation participants, and contact lists may be logged. To avoid this, it is possible to host one’s own XMPP server, but otherwise, it generally will be sufficient to keep this metadata logging potential in mind and take the necessary operational security precautions. For this example, I registered an account at the XMPP homepage. If you wish to remain anonymous, it’s important to register your account over Tor, a VPN like PIA, or both, so to maintain separation between your personal IP and the account you register. If you already feel your internet connection is private and secure, you can click “Add” within Pidgin. Otherwise, it will be best to close the window and configure our Tor connection, first by ensuring that the Tor service is running. We can start this as a daemon using systemd by typing the following. Once Tor is running, and after closing the “Accounts” window, we can access preferences by pressing Ctrl+P or opening it under the “Tools” menu. With this menu open, we’ll want to click on “Proxy” in the left pane. On this window, the “Proxy Type” drop-down menu should be changed to select “Tor/Privacy (SOCKS5)” rather than “No Proxy.” As the Tor service is running on our local system at port 9050, we should change “Host” to 127.0.0.1 and “Port” to 9050. After configuring our global proxy settings, we can add our account by opening “Manage Accounts” under the “Accounts” menu of the main Pidgin window. Here we can add our XMPP account details. Select “XMPP” as the “Protocol” and add one’s username and password. The “Domain” is the server on which you registered your account and the “Local alias” is what your account is named locally. If you’re registering an account on a server which allows online registration, you may wish to check the “Create this new account on the server” box. While Global Proxy Settings should be sufficient for this process, the Tor configuration data can also be added to the “Proxy” tab of the Modify Account window. If the account successfully connects when the “Enable” box is checked, the account is ready to communicate, but not necessarily securely. We need to install a plugin called pidgin-otr (Off-the-Record). Open the “Plugins” manager under the “Tools” menu in Pidgin, and look for OTR, or Off-The-Record messaging, and ensure that it is enabled. Using Pidgin over XMPP is much like using any other instant messaging client. Contacts appear in the main Pidgin menu, and new contacts added, messages started, and chats joined through the “Buddies” drop-down menu at the top left of the window. With these programs installed and configured, you’re ready to chat more securely using Ricochet or XMPP! Using encryption and privacy tools effectively is vital in the face of increasingly sophisticated surveillance which makes private communication less and less guaranteed. It’s up to you, the user, to take responsibility for your privacy in the world we live in, and learning tools like encrypted messengers are the best way to do so.